Why are most college syllabi such drab and dreary affairs? By contrast, Chia-Hua Lin, a PhD student in philosophy at the University of South Carolina, has created a beautiful visual syllabus (see below) for her applied ethics course on “Genetic Engineering and Future Society.” Hat tip: Justin Weinberg, via dailynous.com. This entry was posted in Academia, Philosophy. Bookmark the permalink. I love this. Because of bureaucratic requirements we keep having to add material to our syllabi that render them almost unreadable. One syllabus was so long (27 pages) I ended up writing a synopsis to alert students to the contents that actually affected them. 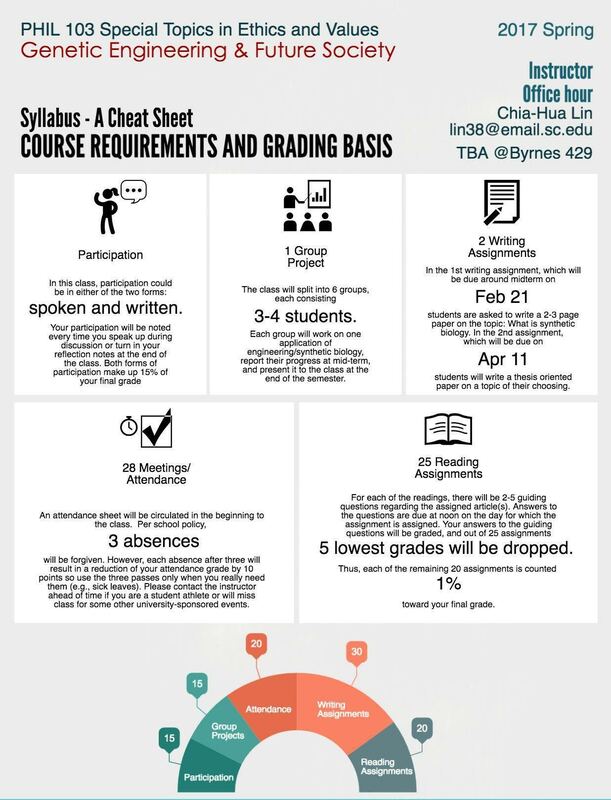 What a monster of a syllabus! That’s why I love this “infographic” approach … It is visually appealing and tells students what they need to know about the logistics of the course.